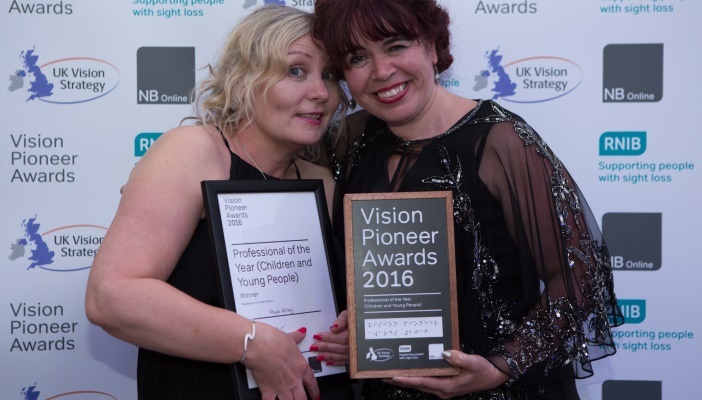 Paula Varney, Family Support Officer at Vista, won Professional of the Year (Children and Young People) at the Vision Pioneer Awards 2016. The awards were held in June to celebrate the outstanding work of professionals in the eye health and sight loss sectors across the UK. “I actually don’t think I’ve won this award for me, to be fair. I think I’ve won it for the amazing team that I work with, the amazing team at Vista and the amazing team at the Leicester Royal Infirmary” said Paula (shown on left). Created by UK Vision Strategy in collaboration with RNIB and NB Online, the awards champion and celebrate good practice and honour the achievements of professionals committed to supporting blind and partially people. The awards also aim to raise awareness of sight loss and the importance of quality eye care by striving towards the outcomes of the UK Vision Strategy.